Ivrea, industrial City of the 20th century, shows the collaborations between industrial and the architectural processes in urban development. 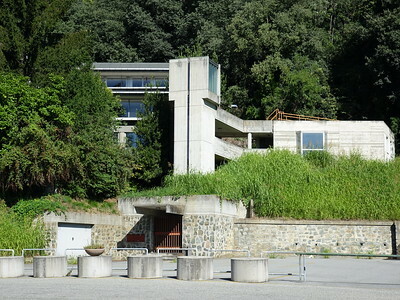 It was the base of operations for Olivetti, a manufacturer of typewriters, mechanical calculators and, later, computers. Especially Adriano Olivetti in the 1930s developed an interest in architecture, as well as urban and community planning. This resulted in a housing plan for workers and social services. Ivrea, industrial city of the 20th century will be submitted by Italy as their cultural nomination for 2018. It was actually already scheduled for 2017, but had to give way to the Venetian Defence Works. Ivrea lies in the foothills of the Alps, about an hour north of Turin. It’s a sizeable city of 25,000 inhabitants. Travelling by train from Turin, you’ll surely know when you’ve arrived in Ivrea: the townscape near the train station is invariably modern with lots of apartment blocks. During the 20th century, the city was transformed into the Olivetti Company Town. Olivetti was a very successful producer of type writers and calculators (until the Age of Computers started). Especially Adriano Olivetti set the most famous Italian architects and planners to work during the period between 1930 and 1960. He promoted a different kind of company town, more geared to the community’s needs (gathered via questionnaires) and involving psychology. This is going to be a serial nomination consisting of the Via Jervis and the Borgo Olivetti. The Via Jervis is the main drag of the modern city, the Borgo Olivetti comprises six self-sufficient single-family homes nearby. The latter were commissioned by Camillo Olivetti (father of Adriano) in 1926. The local authorities have turned the former company town into an ‘Open Air Museum’: this means that several information panels are strategically placed around town. They also have launched a very informative official website with a good map and detailed descriptions of the individual buildings. The completionist in me would have liked a well-signed trail along all 42 of the proposed buildings, but the 'Open Air Museum' is a more associative route somewhat half-heartedly signposted around town. It includes industrial, residential and social facilities. Main focus on Via Jervis is a large factory building with many windows, similar to the Van Nelle Factory or Fagus Factory. Across the street lies a former library, and behind that a still in use kindergarten. Most of the nominated buildings are in private use, and some are hard to see from the street view due to high gates and trees. The most remarkable of the buildings I found the Unità Residenziale Ovest. Better known as ‘Talponia’ (which means Moleville), this is is an underground apartment complex. It is shaped as an amphitheatre, opening up only on one side to its natural environment. I was eager to get a closer look, but came across signs that access to the compound is forbidden. I did see an information panel though on top of the molehill, so I ignored the warnings and walked around a for a bit on what is the roof of the apartment complex. I doubted whether it is still lived in, some of the windows have been covered by newspapers. But earlier I saw two cars leave the (also underground) parking garage. The building was made for basic lodging for graduates and new workers. You can buy one of these apartments today for 51,000 EUR. The photos of the interior made by the real estate company show a box-like structure basking in the sun. I spent some 2 hours in Ivrea and enjoyed my stay. It certainly is recommendable to the many modern architecture adepts active on this website (especially those with fond feelings for Le Corbusier). WH status almost seems a last straw for Ivrea, as it looks a dying town in other aspects. “Today, “for sale” signs are ubiquitous in Ivrea. 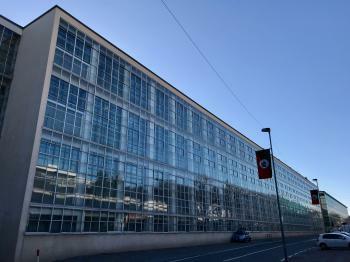 Some of the most iconic buildings commissioned by Olivetti lie empty and abandoned.” is the verdict of this article; "the city has not been able to recover from the decline of Olivetti". I visited Ivrea from Torino by train on a Sunday morning and spent the first half of my 3 hours there walking around. There is a map at http://www.ivreacittaindustriale.it/ as well as on sign posts around town. I did not visit all the elements in the map of this industrial city of the last century but tried to see some of the more interesting places. One of the sign posts pointed to Villa Casana on a hill park in front of Talponia as offering the panoramic view of the town. There are 2 gates to the park, and one of them was slightly open, so I walked in. By the time I go to the Villa I learned at http://www.archiviostoricolivetti.it/ that this villa houses the Olivetti Historical Archive with a permanent exhibition called "One Hundred Years of Olivetti, the Industrial Project." But the Archive was closed on weekend. There was a security guard in a car parked in front of the villa, who asked me how I got in and told me to go back to where I came in from. So I turned back without seeing the panoramic view. I would say visiting Ivrea on a Sunday morning was good and bad because everything was closed. I spent the second half of my visit having a piece of dry pizza at the train station and waiting for my train back to Torino. On my last day in Italy I visited Ivrea from Turin. After loads of medieval /Renaissance/Baroque cities and churches taking in some modern architecture was a welcome change. 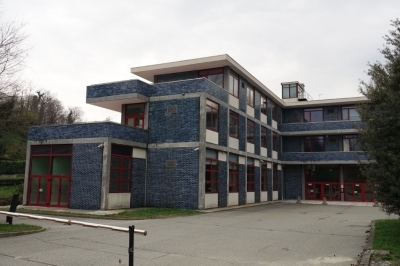 Ivrea was the location of the headquarters of Olivetti and all the components of the site were Olivetti buildings. While nowadays the fortunes of Olivetti have dwindled, it was a very successful corporation for most parts of the 20th century up to the 80s where Olivetti was the second largest manufacturer of PCs worldwide. Olivetti also created several industrial design classics. Walking across town I saw multiple factories, office buildings, and residential buildings. These were constructed over the decades while Olivetti kept growing and their styles vary along with the fashions. Also important to note is that the company buildings are just a part of Ivrea. Ivrea is not a fully artificial town as e.g. Crespi d'Adda is. As such, I found myself repeatedly wondering if I was looking at the site or just a normal building. I do recommend downloading the official map from the nomination website before you visit. The most iconic building is probably the Unitas Residenziale Ovest. The factories are greatly reminiscent of the Van Nelle Factory. And the Centro Studi Ed Esperienza Olivetti offers a colorful Italian touch to modern architecture. As pointed out by Els and other reviewers the state of preservation of the site is not great. Many of the buildings show rust and could use fresh paint. The lawns and trees would also require regular gardening. Finally, the sign posting should be revised and the accessibility of the site improved. I regularly ignored signs telling me that I was forbidden to enter as I was trespassing private property. While these points can be addressed the more central critique I see is that these buildings are not original or defining of an era. Each building at the time of construction was what modern architecture looked like. But Ivrea was working with and innovating on existing ideas (Fagus, Tugendhat, Van Nelle), not defining them. Still, I would favor inscription. 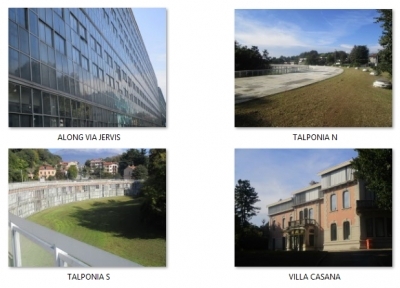 While most modern architecture sites are documenting a single point in time, Ivrea shows a bit better the development of architecture in the 20th century. It also manages to combine factories, offices and low to high end residential buildings into one location all the while adding a unique Italian design flavor. Northbound to Aosta from where you can cross into France by bus to Chamonix. Eastbound to Novara from where you can continue to Milan. The site itself more or less starts directly at the train station along Ave Jervis. My wife and I visited Ivrea in January 2018 on a sunny winter's afternoon. It's an easy one hour train ride from Turin's two main stations, and trains leave about every hour. The (proposed) World Heritage area is adjacent to the train station, and everywhere is fully walkable. There's a nice trail of information signs, talking about the Olivetti company and its eponymous founders - the main employers for the town in the 20th century. The large factory building is very impressive and reminded us quite a bit of the Van Nelle factory in Rotterdam. It seems the town has rebounded a bit since Els's visit, as the main factory building is now occupied by offices for Vodafone Italy, and a few workers were buzzing around (though we visited on a Saturday). The area we walked around did have a lot of closed shops, but it didn't seem particularly grimmer or worse-off than many other areas in Italy. We were a little disappointed in the crescent-shaped building, as there's not really anything to see since it's built into the side of a hill (and there's large NO TRESPASSING signs). Though I guess all the windows look into the centre of the crescent, and I can imagine the residents don't want visitors peering in! Overall we enjoyed our visit. We stopped to read all of the information signs, and our visit took about 2 hours all up.